HONESTY is a virtue that 59-year-old street sweeper Avelino Sumagang swears by even if he earns barely enough to support his family. "Kita nga nanarbaho, be honest ta. Kay makatabang man na sa atong pagpanarbaho" (We employees must exercise honesty in doing our jobs because this will benefit us), says Sumagang. 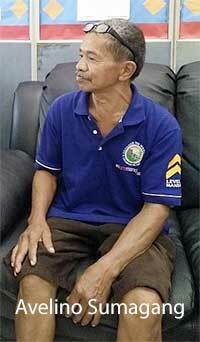 Assigned under the Clean and Green Office of the Mandaue City government for a decade now, Sumagang found a black sling bag which contained a wallet and an iPhone while he walked past a bakeshop at S.B. Cabahug Street. Sumagang immediately brought the bag to the Centro Barangay Hall and asked for assistance from the barangay secretary to help contact its owner, William Karaat, a seafarer living in Barangay Labogon, Mandaue City. "Ang naa sa akong huna-huna, iuli (What came into my mind was to return the valuables)," Sumagang said. Karaat thanked Sumagang and gave him P1,000 but he refused, saying he was just doing the right thing and he wasn't asking for any reward. "I know exactly how painful it is to lose something, most especially money, even more so if you earned it by the sweat of your brow," Sumagang said in Cebuano. Sumagang said he encountered a similar incident 12 years ago in which he found a wallet containing cash and ID cards in Barangay Maguikay. He said he went all the way to Consolacion town to return the item to its owner. Sumagang, a native of Oroquieta City, has four children with his wife who are staying there. The act of Sumagang touched some individuals including Presidential Assistant for the Visayas Michael Lloyd Dino. Yesterday, the Office of the President, through Dino, handed P5,000 and a plaque of recognition to Sumagang for his good deed. "This is really a heroic act because he has the option to keep it but he returned it. He will serve as a good example," Dino said. 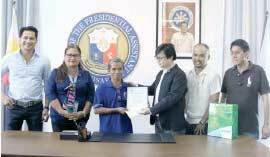 Sumagang has been serving the Clean and Green Office of Mandaue City for more than ten years. Anthony Ting, a businessman from Mandaue City who was touched by the honesty of Sumagang, also gave a livelihood grant to the street sweeper. Sumagang earns a monthly honorarium of P4,000 and cleans the area between the National Shrine of St. Joseph to the Mandaue City Health Office. To make both ends meet, Sumagang also works as a caretaker of an apartment in Barangay Centro where he is being paid P3,000 to P4,000 for the service. WorldSweeper is proud to add Filipino street sweeper, Avelino Sumagang, to our Noteworthy in Sweeping database. We found this information in March of 2017 in an article written by the Cebu Daily News Inquirer.net.